Triple Negative Breast Cancer (TNBC) is occurred in the mammary gland epithelial malignant tumours, which is easy to recurrence and metastasis. Carcinoembryonic Antigen (CEA) is a kind of glycoprotein, which is widely existed in various human cancer cells. The purpose of this study was to investigate the role of CEA in the prognosis for TNBC patients who received Neoadjuvant Chemoradiotherapy (NCRT). A total 783 TNBC patients and 752 healthy women individuals were enrolled to analyse the prognostic role in the treatment of TNBC. The median follow-up time was 34.5 months. Pathology analysis showed that CEA expression was up-regulated in TNBC tumour tissues. We showed that plasma CEA levels were higher in TNBC patients than healthy individuals. We showed that higher plasma CEA levels were down-regulated in patients received NCRT. Outcomes demonstrated that higher plasma CEA levels presented lower the 5 y Disease-Free Survival (DFS) rates, while lower CEA levels showed a significantly lower 5 y DFS rate (P<0.05). In conclusion, these results indicate that plasma CEA levels were up-regulated in TNBC patients, which suggest that plasma CEA levels are associated with the prognosis of TNBC patients after receiving NCRT. Breast cancer is epithelial malignant tumours occurred in the mammary gland that has become a significant threat to women's physical and mental health [1,2]. Triple negative breast cancer (TNBC) is one kind of breast tumours, which is a heterogeneous tumour that encompasses many different subclasses of the disease . TNBC is especially characterized by breast cancer patients with negative Estrogen Receptor (ER), Progesterone Receptor (PR), and Human Epidermal Growth Factor Receptor-2 (HEGF-2) [4,5]. Previous study has indicated that TNBC is a phenotype of breast cancer with aggressive clinical behaviour for the absence of optimal treatment, the prognosis of this disease is poor . Therefore, exploring prognostic factor to detect the response to Neoadjuvant Chemotherapy (NACT) in a TNBC patients are required to evaluate therapeutic effects and the long-term survival in clinic. Carcinoembryonic antigen (CEA), a kind of glycoprotein, is widely expressed in various tumour tissues, which has been regarded as antigen for the patient's immune response [7,8]. Previous study has showed that there is an association of elevation of CEA postoperatively with different clinical stages of breast cancer and elevated CEA levels postoperatively are associated with an increased risk of development of recurrent . Immunotherapy targeting for ErbB-2 and CEA presented efficient inhibition for human breast cancer . Importantly, CEA can be detected in the serum in majority of breast cancer patients with metastatic, which may be used as prognostic tumour marker in advanced breast cancer. In this study, we investigated expression levels of plasma CEA levels in TNBC patients and healthy women individuals. We explored the association between plasma CEA levels and prognosis of TNBC patients. Here, we identified that plasma CEA levels were up-regulated in TNBC patients, which are associated with the disease-free survival (DFS) rates of TNBC patients after receiving Neoadjuvant Chemoradiotherapy (NCRT). This study was approved by the ethics committee of Heilongjiang Province Nongken General Hospital. All patients were asked to provide 5 ml venous blood and were required to write informed consent with signature. A total of 783 TNBC patients and 752 healthy women individuals were included in this retrospective cohort in Chinese Han population. The mean of age was 35.2 ± 12.7 and 36.8 ± 13.6 y in TNBC patients and healthy individuals, respectively. According to the plasma CEA levels, TNBC patients were divided into higher CEA levels (>3.5 ng/dl) and lower CEA levels (<3.5 ng/dl). Patients with TNBC received treatment of Neoadjuvant Chemoradiotherapy (NCRT) and DFS, LRFS and DMFS were calculated using the maximally selected log-rank test. The plasma concentration levels of ER (DYC5415-2, R and D Systems, Inc.), PR (DYC5715-2, R and D Systems, Inc.), HER-2 (DHER20, R and D Systems, Inc.), and CEA (DEP00, R and D Systems, Inc.) in patients with TNBC and healthy individuals were analysed by commercialized ELISA Kits. The operational procedures were performed by the manufacturer’s instructions. The results were performed by ELISA reader system (Bio-Rad). Tumour sections were frozen and sections were cut in a cryostat after perfusion, fixation and cryoprotection. Freefloating sections were rinsed and placed in the solution with the primary antibody of rabbit anti-human CEA (1:500, ab133633, Abcam) for 12 h at 4°C. Tumour sections were the stained horseradish peroxidase-conjugated anti-rabbit IgG (1:10000, Bio-Rad, Hercules, CA, USA). The sections were washed and observed by fluorescent video microscopy (BZ-9000, Osaka, Japan). Immunohistochemical procedures were previously reported in detail . Continuous variables were shown as mean ± SD and analysed by student’s t-test. All data were analysed using SPSS Statistics 19.0 and Graph pad Prism version 5.0 with the help of Microsoft Excel. Allele and genotype frequencies were calculated by using direct counting. Results of allele and genotype frequencies were determined by STATA SE 12.1 software. *P<0.05 was considered statistical differences. We analysed plasma levels of ER, PR, HER-2 in patients with TNBC. As shown in Figure 1A-1C, plasma ER, PR, HER-2 levels were negative in patients with TNBC. Expression levels of CEA were analysed in tumour tissues in patients with TNBC. Histopathologic image demonstrated that CEA expression levels were up-regulated in TNBC tumour tissues (Figure 1D). These outcomes suggest that expression levels of CEA were up-regulated in tumour tissues in patients with TNBC. Figure 1: Expression levels of CEA in tumour tissues in patients with TNBC. (A-C) Plasma levels of ER (A) PR (B) HER-2 (C) were negative in patients with TNBC. 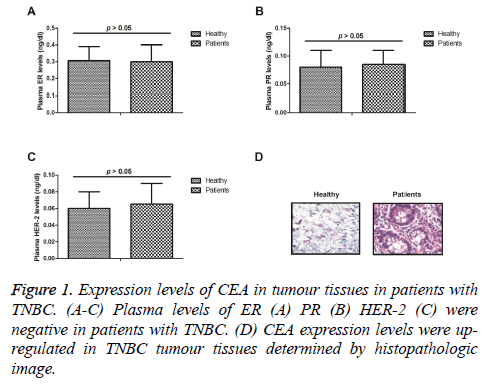 (D) CEA expression levels were upregulated in TNBC tumour tissues determined by histopathologic image. Plasma levels of CEA in patients with TNBC were investigated prior and post treatment with NCRT. As illustrated in Figure 2A, patients with TNBC revealed higher plasma CEA levels in TNBC patients compared to healthy individuals. Results demonstrated that plasma levels of CEA were down-regulated for patients after received NCRT (Figure 2B). These outcomes indicate that plasma levels of CEA are up-regulated in patients with TNBC, which are down-regulated by NCRT. Figure 2: Plasma levels of CEA in patients with TNBC. (A) Patients with TNBC have higher plasma CEA levels than healthy individuals. (B) Plasma levels of CEA were down-regulated for patients after received NCRT. We further analysed the association between plasma levels of CEA and disease-free survival (DFS) in patients with TNBC after received NCRT. Outcomes demonstrated that higher plasma CEA levels presented shorter 5 y disease-free survival (DFS) rates, while lower CEA levels showed a longer 5 y DFS rate (Figure 3A). Outcomes also showed lower CEA levels presented lower LRFS and DMFS for patients after NCRT at the median of 60 months of follow-up (Figure 3B-3C). These results plasma levels of CEA are associated with progression of patients with TNBC after NCRT. Figure 3: Plasma levels of CEA is associated with progression of TNBC patients. (A) Higher plasma CEA levels present shorter 5-year disease-free survival (DFS) rates. 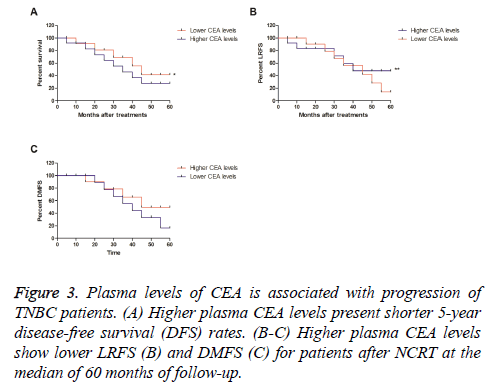 (B-C) Higher plasma CEA levels show lower LRFS (B) and DMFS (C) for patients after NCRT at the median of 60 months of follow-up. We investigated plasma levels of CEA and pathological factors in patients with TNBC after received NCRT. We observed that lower CEA levels presented smaller tumour mass (Figure 4). Outcomes demonstrated that there was no correlation between plasma CEA levels and clinical stage of TNBC. These results suggest that plasma levels of CEA are associated with tumour mass for patients with TNBC after received NCRT. Clinical investigations have indicated that 5 y overall survival ranges from 4-28% and recent reports suggested that the relative proportion of breast carcinoma in young women is growing, whom is frequently metastatic once diagnosis [12,13]. Evidences have showed a significant relationship between metastasis status and positive CEA levels, which suggest that high CEA levels decreased sensitivity and specificity for TNBC after received NCRT . In this study, we investigated the role of plasma CEA levels in the progression of patients with TNBC after received NCRT. We reported that plasma CEA levels were up-regulated in patients with TNBC, which were down-regulated after received NCRT. Findings indicate that expression levels of CEA were upregulated in tumour tissues in patients with TNBC, suggesting plasma levels of CEA are associated with DFS, LRFS and DMFS for patients with TNBC after NCRT. Currently, although surgery, radiotherapy, chemotherapy, Chinese medicine treatment, biotherapy, target therapy and other comprehensive treatments for human breast cancer, the 5 y overall survival is poor [15-17]. Hence, finding prognostic factor for breast cancer may be contributed to evaluate the progression after received chemoradiotherapy. Previous study has showed that serum CEA levels were up-regulated in patients with TNBC . However, the prognostic role in the progression of patients with TNBC has not analysed in previous work. We indicated that plasma levels of CEA are associated with tumour mass for patients with TNBC after received NCRT, which further elaborated the potential function of CEA for TNBC patients. Currently, periodic measurement of serum CEA presents an indicative function that can be regarded as postoperative surveillance after breast cancer surgery . Giovanella et al., have indicated that serum CEA may be a potential tumour marker for breast cancer due to the up-regulation in the diagnosis, prognostic evaluation and follow-up of breast cancer patients . Additionally, the relationship between circulating CEA levels is a good prognostic marker for primary tumour and metastases in breast cancer patients . In this study, we first analysed changes of plasma CEA levels in TNBC patients. We reported that plasma levels of CEA are up-regulated in patients with TNBC, which are down-regulated by NCRT. We also indicated plasma CEA levels are associated with tumour mass for patients with TNBC after received NCRT. In conclusion, this study has revealed plasma CEA levels are up-regulated in TNBC patients and the post-NCRT CEA plasma levels may be a potential prognostic factor for DFS, LRFS and DMFS in TNBC patients after received NCRT. We indicated that plasma CEA levels are an independent prognostic factor for progression of patients with TNBC after NCRT. These outcomes would be helpful in diagnosing and evaluating progression of TNBC patients who received NCRT. Schipper RJ, Moossdorff M, Beets-Tan RG, Smidt ML, Lobbes MB. Non-invasive nodal restaging in clinically node positive breast cancer patients after neoadjuvant systemic therapy: a systematic review. Eur J Radiol 2015; 84: 41-47. Jansen LA, Backstein RM, Brown MH. Breast size and breast cancer: a systematic review. J Plast Reconstr Aesthet Surg 2014; 67: 1615-1623. Mori H, Kubo M, Nishimura R. BRCAness as a biomarker for predicting prognosis and response to anthracycline-based adjuvant chemotherapy for patients with triple-negative breast cancer. PloS One 2016; 11: e0167016. Newman LA, Stark A, Chitale D. Association between benign breast disease in African American and white American women and subsequent triple-negative breast cancer. JAMA Oncol 2016. Park VY, Kim EK, Kim MJ, Yoon JH, Moon HJ. Perfusion parameters on breast dynamic contrast-enhanced MRI are associated with disease-specific survival in patients with triple-negative breast cancer. Am J Roentgenol 2017; 208: 687-694. Shao Z, Chaudhri S, Guo M, Zhang L, Rea D. Neoadjuvant chemotherapy in triple negative breast cancer: an observational study. Oncol Res 2016; 23: 291-302. Mujagic Z, Mujagic H, Prnjavorac B. The relationship between circulating carcinoembryonic antigen (CEA) levels and parameters of primary tumour and metastases in breast cancer patients. Medicinski Arhiv 2004; 58: 23-26. Seker D, Kaya O, Adabag A, Necipoglu G, Baran I. Role of preoperative plasma CA 15-3 and carcinoembryonic antigen levels in determining histopathologic conventional prognostic factors for breast cancer. World J Surgery 2003; 27: 519-521. Nakamura T, Kimura T, Umehara Y. Periodic measurement of serum carcinoembryonic antigen and carbohydrate antigen 15-3 levels as postoperative surveillance after breast cancer surgery. Surgery 2005; 35: 19-21. Dorvillius M, Garambois V, Pourquier D. Targeting of human breast cancer by a bispecific antibody directed against two tumour-associated antigens: ErbB-2 and carcinoembryonic antigen. J Int Soc Oncodevelopmental Biol Med 2002; 23: 337-347. Dirani M, Nasreddine W, Abdulla F, Beydoun A. Seizure control and improvement of neurological dysfunction in Lafora disease with perampanel. Epilepsy Behav Case Rep 2014 2: 164-166. Ziyadi M, Boujoual M, Raiteb H. Squamous cell carcinoma of the breast: report of a case and review of the literature. Pan Afr Med J 2016; 24: 213. Zagelbaum NK, Ward MF, Okby N, Karpoff H. Invasive ductal carcinoma of the breast with osteoclast-like giant cells and clear cell features: a case report of a novel finding and review of the literature. World J Surg Oncol 2016; 14: 227. Bahrami A, Mortazavizadeh MR, Yazdi MF, Chamani M. Serial tumour markers serum carcinoembryonic antigen and cancer antigen 15-3 assays in detecting symptomatic metastasis in breast cancer patients. East Mediterr Health J 2012; 18: 1055-1059. Hamelinck VC, Bastiaannet E, Pieterse AH. Patient’s preferences for surgical and adjuvant systemic treatment in early breast cancer: a systematic review. Cancer Treat Rev 2014; 40: 1005-1018. Sawesi S, Carpenter JS, Jones J. Reasons for non-adherence to tamoxifen and aromatase inhibitors for the treatment of breast cancer: a literature review. Clin J Oncol Nursing 2014; 18: 50-57. Hidding JT, Beurskens CH, van der Wees PJ, van Laarhoven HW, Nijhuis-van der Sanden MW. Treatment related impairments in arm and shoulder in patients with breast cancer: a systematic review. PloS One 2014; 9: e96748. Fu Y, Li H. Assessing clinical significance of serum ca15-3 and carcinoembryonic antigen (CEA) levels in breast cancer patients: a meta-analysis. Medical science monitor. Int Med J Experi Clin Res 2016; 22: 3154-3162. Giovanella L, Ceriani L, Giardina G, Bardelli D, Tanzi F, Garancini S. Serum cytokeratin fragment 21.1 (CYFRA 21.1) as tumour marker for breast cancer: comparison with carbohydrate antigen 15.3 (CA 15.3) and carcinoembryonic antigen (CEA). Clin Chem Laboratory Med 2002; 40: 298-303.